In the second installment of my Benefit of the Doubt series over at BtBS, I examine starters who steal extra strikes outside the zone. 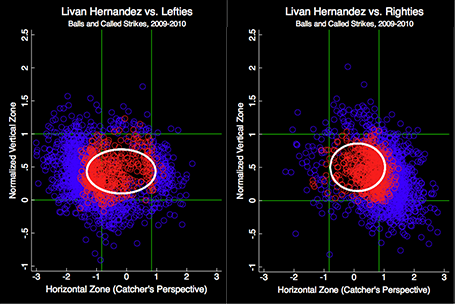 I also look deeper into what makes a pitch more or less likely to win the umpire's favor. Controlling for location, fastballs with strong horizontal or (especially) vertical movement are more likely to favor the pitcher. Contextually, an umpire is most likely to call a strike that the Pitch FX system disagrees with when the pitcher is pitching at home, in the playoffs, facing a right-handed batter, when the there are more outs, more balls, and fewer strikes on the batter, and/or when there are runners on first and/or second, ceteris paribus.